If you own a dog, you should make sure that exercise is an important part of his daily routine. Experts suggest that you should at least walk your dog on a daily basis. However, some conditions or barriers can hinder the task of exercising your dog. For instance, dog owners usually take a break from taking their dog out for a walk during the winter season or extremely hot conditions. Knowing the importance of exercising your dogs on a daily basis, you can consider some innovative ways to doing this indoors. Some of these ideas, once set up; rarely need additional effort to making your dog workout. If there is no way of taking your dog outdoor for exercise, an ideal means to keeping him active is to make him run up and down the stairs. Using the steps can add some special challenge your pooch’s workout regime. This exercising strategy flexes some additional muscles of your dog as compared to the normal walking routine. One way of making your dog run up and down the stairs is by using his favorite or a ball to play fetch. Stand on top of the stairs and throw down the toy, make your dog to bring back the toy to you and repeat this two or three times with sufficient break time in between. Using the treadmill to walk or even run your dog is another ideal means of making him exercise indoors. Bear in mind that treadmill can be a new experience for your dog and you might have to accustom him to its noise and the working environment to get the task done efficiently. You can use treats to accustom your pooch to treadmill. Place him on the treadmill and start slow, take quick short breaks in between and provide him with treats in the interim. This will help you to associate the experience with some good memories and also compel him to keep going. Another means to get your dog to workout is to design a treat hunt. Get some of his favorite treats and hide them throughout the house; behind doors, under the table and so on. Your furry friend will be busy tracking the treats and will tire himself out. You can also resort to a treat dispensing toy to keep your dog physically engaged. Setting up some obstacle courses throughout the house is another means to ensure that your dog stays engaged physically and mentally. You can use pillow cushions or hula hoop to create obstacle courses indoors. If there are children at home, this can be a fun activity for both the parties. You can use treats to ensure that your dog completes each obstacle course. If your dog has another four legged friend who he meets regularly at the park or if your friend has a pet dog, arrange an indoor play date. You can take your dog to your friend’s home or vice versa. This will help you to keep both the dogs engaged and happy. 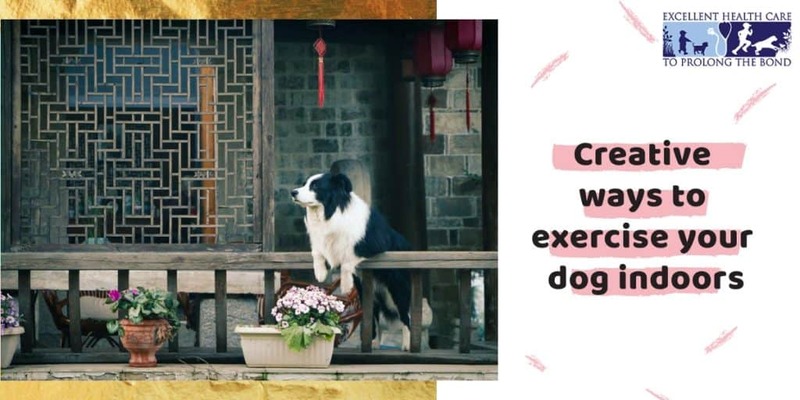 Exercising your dog on a regular basis can be really beneficial when it comes to taking off concerns like obesity and hyperactivity from the charts. Always pay attention to your dog’s needs and keep an eye on him while he is engaged in any physical activity indoors.